Plants are some of nature’s best scientists, developing chemicals and compounds to ward off bugs intent on devouring their leaves. It seemed like a natural place to start to find an effective way to keep bugs from devouring us. 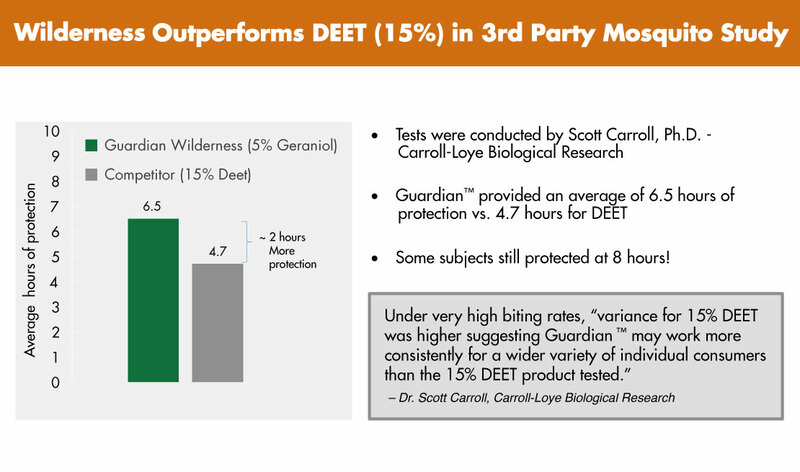 At Guardian our own scientists have married nature and science by taking a cue from plants with the natural repellent Geraniol and increasing its effectiveness to develop the first plant-based bug repellent that outperforms DEET in scientific testing and field trials. This breakthrough technology provides a unique combination of ingredients to deliver performance superior to other Geraniol-based formulas. 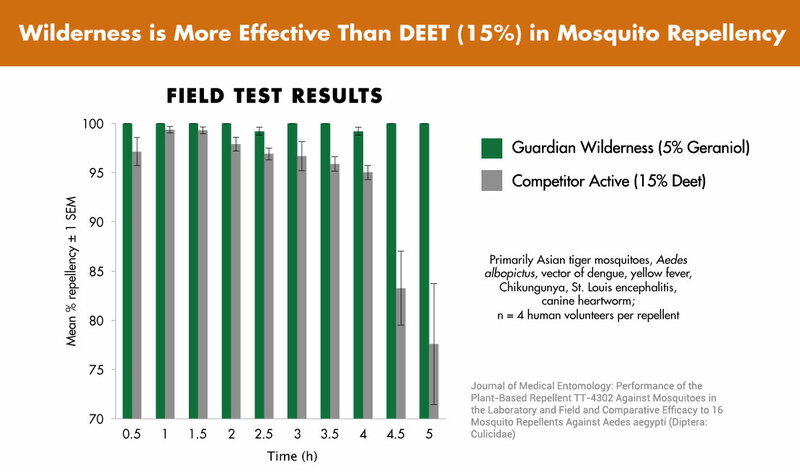 In studies, Guardian Wilderness outperformed 15% DEET against mosquitoes. 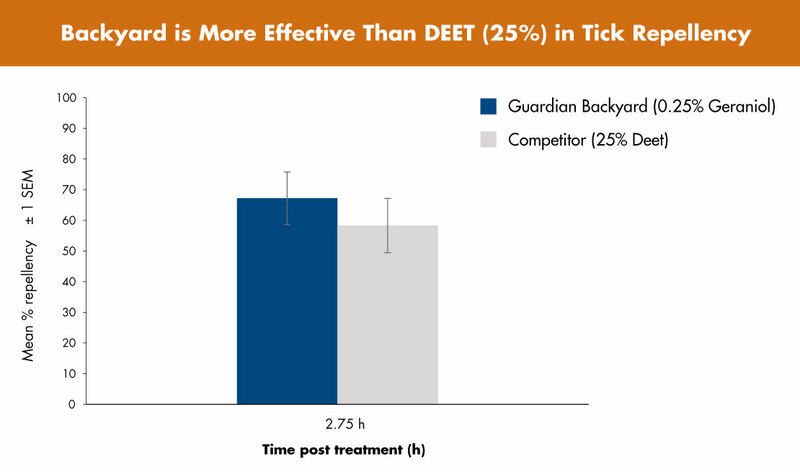 Guardian Backyard performed equivalent to 15% DEET against mosquitoes. 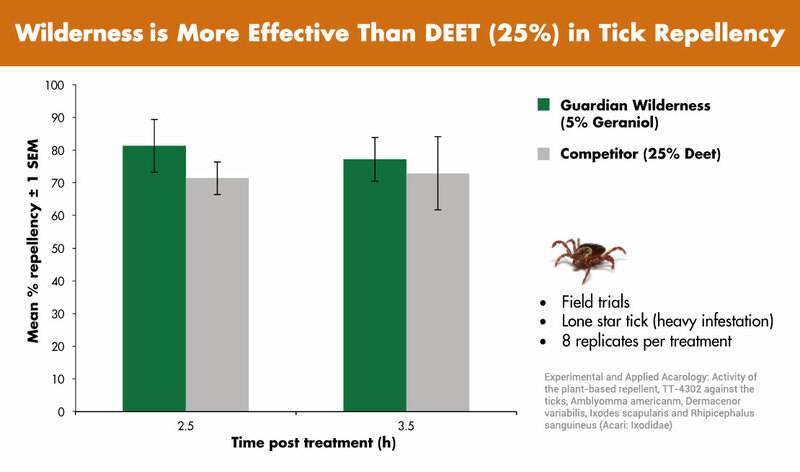 Both formulas performed equivalent to 25% DEET against ticks. Choose from the Wilderness 8-Hour or Backyard 4-Hour formulas, each optimized for effective, safe repellency with durations matched to your outdoor plans. Now, you no longer have to choose between DEET-based repellents and less than effective all-natural repellents. Guardian’s merging of science and nature is a win-win situation for everyone. Except bugs, naturally. Many of us are more vigilant these days about what we put on and into our bodies –from the foods we eat to the cosmetics we apply and products we purchase. Naturally derived solutions tend to be kinder to our bodies and our environments. For centuries people have found cures in nature for ailments. Even the common aspirin comes from the Willow Tree. It’s just a matter of us finding them. And for bug repellents, that time is here. Thanks to the partnership between Guardian’s laboratory and nature’s laboratory you don’t have to trade alternative solutions for effectiveness anymore. Guardian takes a nature-derived active and boosts its power through advanced formulation technology. Guardian is safe and non-toxic. It’s the best alternative for your body, your health, your children, and the environment. Guardian doesn’t have a chemical smell and doesn’t leave that sticky residue like chemical compounds that feels like you sprayed yourself with adhesive. Guardian provides a solution for people who have skin sensitivity to DEET or for whom DEET doesn’t work effectively. Guardian is not only extremely effective against mosquitoes and ticks, but lasts without a need for frequent reapplication. Now there’s even less of a reason to use repellents containing DEET to protect your family and your environment. Guardian is a win-win situation for everyone. Except bugs, naturally. Have you ever eaten something so bitter you spit it out? Or smelled something that repulsed you and made you instinctively recoil and back away? Then you know how mosquitoes and ticks feel when they get close to Guardian repellents. Our repellents harness the biological defenses that plants create to repel their own pesky predators looking to devour their leaves. 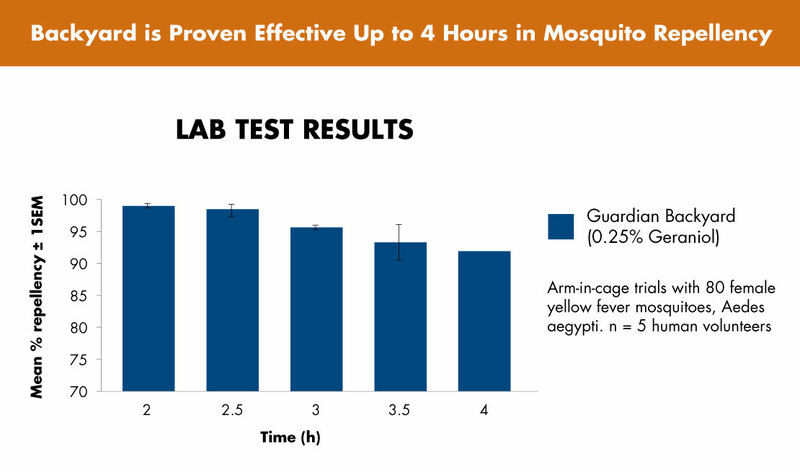 We’ve isolated and extracted the compound Geraniol as our active ingredient, which deters bugs with its unappealing qualities, driving them away in search of more appetizing targets. The plant-based, non-toxic ingredients of Guardian repellents create a force field against bugs that keeps them away, letting you get on your way to having fun in comfort in the outdoors. Our patented Nature’s Technology® is based on exhaustive studies and research as well as third-party scientific review. But you don’t have to take our word for it; we invite you to dig deeper and see for yourself what we’re made of. ©2017 TyraTech, Inc. All Rights Reserved.